My homebrewing frequency has taken a nosedive recently (surprise), but I still try to find time to brew a weird batch when I can. 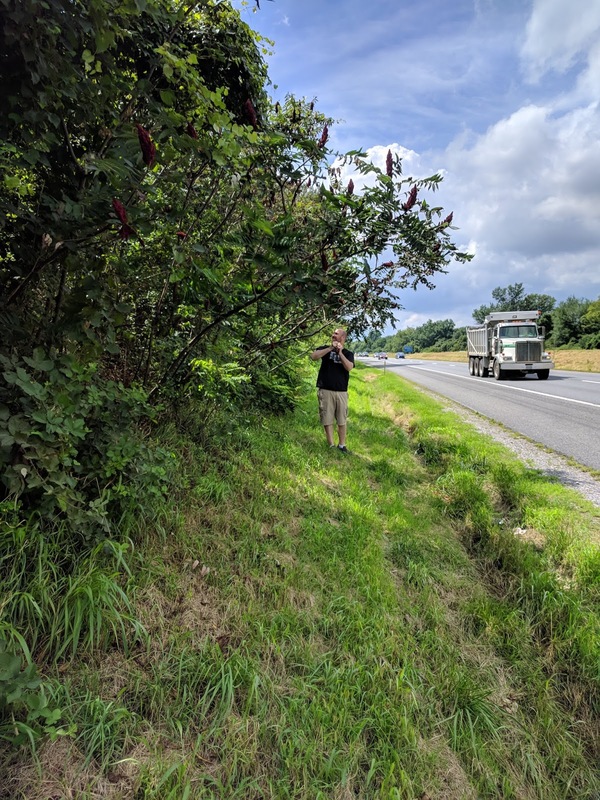 In August, when Scott and I drove to pick-up our first hop order in western Maryland, I noticed that Staghorn Sumac was in full bloom along I-270 . I’d read about flavoring beer with it in The Homebrewer’s Almanac, but never actually tasted a beer brewed with it. Sumac is tart and fruity, traditionally used in a tart lemonade-like beverage. I pulled over and harvested about a pound. The range I’d read was 1-5 lbs per 5 gallon batch. Without a beer ready for them, I took the clusters of dusty berries off of the central twig, vacuum sealed them, and froze. That was enough of an excuse to brew a batch of Berliner weisse (fermented with US-05 and Omega Lacto Blend). After primary fermentation I racked 1 gallon onto the resulting .75 lbs of sumac, and another onto .5 oz of dried Turkish sumac from Penzeys. Obviously if the dried version is just as good, it certainly would be easier! Smell – Aroma is light, doughy-grain, lightly citrus and roasted pear. An odd note of cinnamon as well. Appearance – Clear pale yellow. It’s almost so pale that yellow isn’t the right word, it looks washed out, faded. Retention isn’t great, but the tight, white head sticks around for much longer than the other half of the batch. Taste – Bright acid without being obnoxious. The finish has an odd fall-spice note as in the nose that I suspect is from the sumac. Dry without being a desert. Mouthfeel – Classic Berliner, light and spritzy. Drinkability & Notes – The not-entirely-pleasant musty-herbal flavor the dried sumac provided when the beer was young seems to have mostly faded to a light spiciness. I’m not sure I’d even pick it out if I didn’t know it was in there. Changes for Next Time – Maybe a different/fresher source of dried sumac would provide a better flavor and aroma? Smell – Aroma has the generic fruitiness of Hawaiian Punch, or Hi-C, but with an herbal hint of a Ricola cough drop. I don’t get any of the base beer, at this elevated rate it is all sumac. Certainly in the same sort of flavor-family as hibiscus. Taste – The same fruit flavor from the nose, but more pronounced cherry candy. It’s a really fun flavor, that doesn’t stray into cloying. Acidity is snappy, sort of Vitamin-C, quick and punchy. No sweetness, finally breaks the comparison to “fruit” beverages. Mouthfeel – Light, medium+ carbonation, but not excessively thin or harsh. 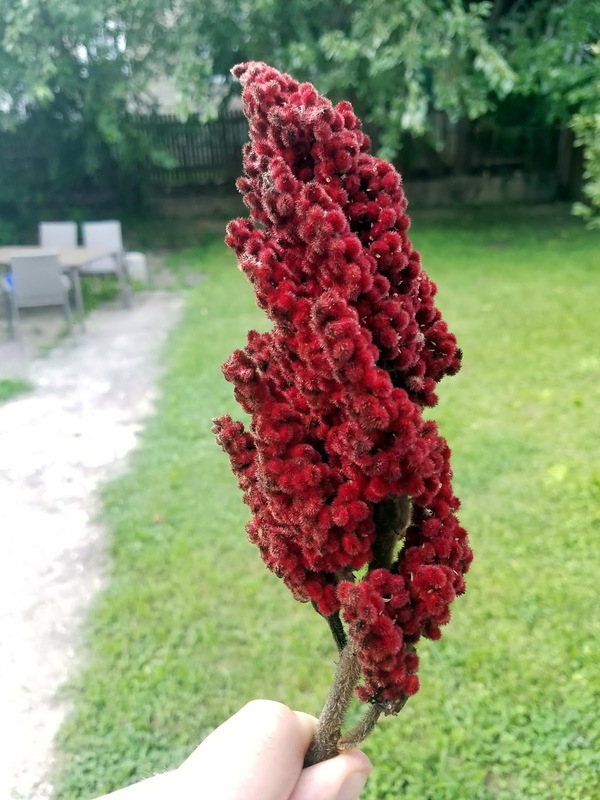 Drinkability & Notes – Staghorn sumac is a foraged ingredient that has a real chance for broader appeal. The flavor is fun, quenching, and somewhat familiar. The color certainly doesn’t hurt either. With how much it took, a mild base beer like this makes the most sense. Changes for Next Time – I was sort of hoping this one wouldn’t be delicious so that I didn’t have to source a couple hundred pounds to put into a beer next summer. Likely could drop down closer to .5 lbs/gallon for a more balanced beer, but it is delicious as is! I’ll be making the trip down to Asheville, NC March 22-23 for another round of BYO Boot Camps! As usual I’ll be talking about Wood/Barrels one day and Sour Beers the other. I said it before, but this really is looking like the last one of these for me given how much time running a brewery takes!